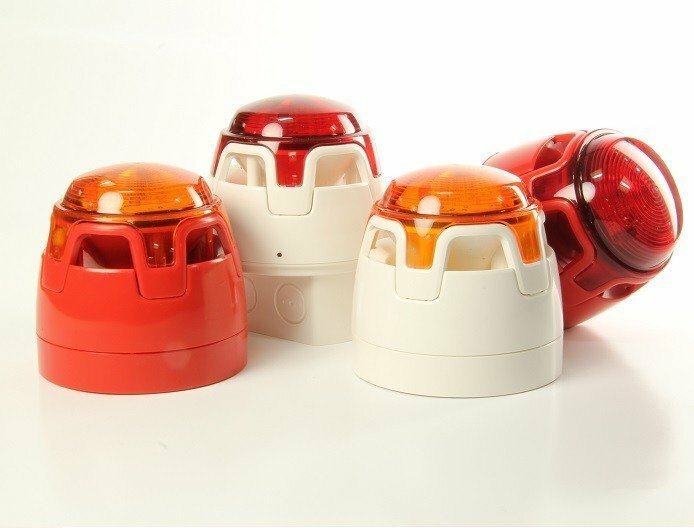 KAC's conventional Sounder Beacon is ideal for applications where a sounder is required as the primary method of alarm, but a supplementary light indicator would also be of benefit. The product features a new folded horn design, LED technology and advanced optics, providing outstanding sound output and supplementary light indication at very low current draw. The ENscape sounder beacon delivers outstanding quality, reliability and extended operational life, making it the ideal choice for a wide range of applications. Modern design and aesthetics eliminates need for device orientation. Deep base option with multiple cable entries for flexible installation. Designed with full range of common fixing centres. Positive fit engagement & feedback of base with device for easy installation. Suitable for wall and ceiling mount applications. Available in red or white body colours with red or amber lens. Range of installation and base options, for indoor and applications up to IP65. Optimised for 12V and 24V systems, making the range suitable for use in fire & security applications. Superior sound output and low current consumption. 32 tones all approved to EN54-3. Two stage sounders enable alert and alarm sequence to be set for phased evacuation. Synchronised fl ash and sound output.